​As the season of Advent is upon us, each week there will be an advent devotional and Christmas Eve devotional that you can do on an evening with your family or by yourself to prepare for the coming of Christ. There are links to carols , songs and scripture but you can use your own as well. 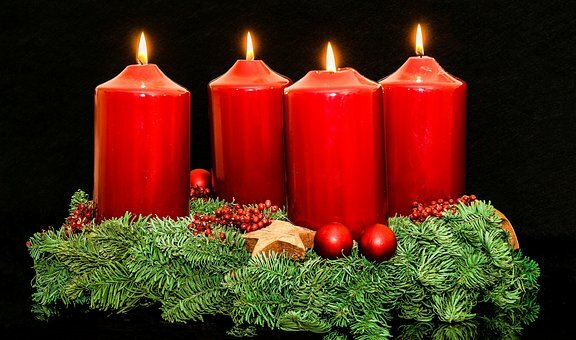 If you would like to construct an Advent wreath simply gather 5 candles 3 purple one pink and one white for Christmas Eve. Light the first candle and say Jesus Christ is our hope. Light the second candle and say Jesus Christ is our hope for peace. Light the third candle and say: Because God loves us, we can love. What are some joys and sorrows you have had in the past week? How can you experience joy even when things are not going the way we would like them to? Share or wright things we can do and ways we can help each other to make the week a joyous one. Emphasize how we can bring joy to others there by bringing joy to ourselves. May God’s Peace be with you as you prepare for the coming of the birth of Jesus. Amen. This candle represents love because Christ loved us enough to come to earth so that all people can be saved. and those who mourn and are not comforted. One thing you will do to show love for someone else this week. One thing you will do to show love to yourself this week. May God’s Love be with you as you prepare for the coming of the birth of Jesus. Amen. Jesus Christ is our hope for peace. This candle stands for the peace that only Christ and his way can bring to our lives. What is the first thing you think of when you hear the word peace? When was a time recently of real peace and contentment in the house? Why? What made it so? When was it not so peaceful? Why? Who is the peacemaker in our family? Paul had a different kind of peace. What was it? How did he get it? Are there times in your life at school, at home, or some where else that you are afraid and need this kind of peace? Who can give it to you? There really is a God of love! This candle represents hope. Long ago people had hope in their hearts as they waited for a savior, someone who would come to set people free. We hope too for the Savior’s love to be shared with our friends and to spread throughout the world. Journal or discuss one hope for your future. What does Christian hope have to do with our hopes? Re-read Luke 1:37. “For with God nothing will be impossible.” Do you know someone in the neighborhood or in the world who is without hope? How can we tell the good news to that person? Of the fever of hurry. For Christmas: "The Mass of the Christ." May God’s Hope be with you as you prepare for the coming of the birth of Jesus. Amen.